The “Selah” probably meant, pause, or a musical interlude before the singing continued. 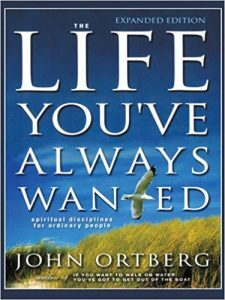 John Ortberg is one of my favorite authors and pastors. Several year ago, Ortberg moved from sunny, laid back southern California to pastor a mega-church in Chicago. As he was settling into his new city and new position he decided to call his mentor, a very wise & spiritual man, for some advice. “You must ruthlessly eliminate hurry from your life.”Another long pause. Hurry keeps us consumed with the “cares and riches and pleasures of life,” as Jesus put it. The problem is constant activity does not draw us near to God. Jesus was aware of this in this day and he routinely withdrew from the crowds and from activity, and he taught his disciples to do the same. “Come away to a deserted place all by yourselves and rest a while,” he said in Mark’s Gospel. Now please don’t misunderstand – Jesus was often busy, going from town to town, person to person, but he was never frenetic, hurried, inwardly rushed. Or how about this, “Come on, kids, let’s go! Let’s go! Let’s go! Hey, let’s see who can get dressed the quickest!” I did this a lot when my sons were young. Then I realized that I was always rushing them! Car Wash Illustration. A few years ago I pulled up to a drive-through car wash. I’m sure the attendant said, “Please put your car in neutral.” But I didn’t hear him. 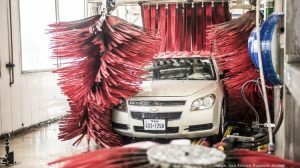 Have you ever gone through one of those car washes with your car in drive? I don’t recommend it! It goes far faster than it’s supposed to go! And things are coming at you very fast, slamming into the car. You’re pretty sure that a windshield is gonna bust. It was scary and it was funny. But is also gave me an image for impatience and hurry sickness. Impatience is going at the wrong pace for what the situation calls for. It’s speeding up something that shouldn’t be sped up. Many of us are living life at the wrong pace. That’s why it feels like we’re always getting slammed! Years ago, you wrote someone a letter. It took several days to get there. They might write you back in a few days, and then it would take several more days to get back to you. The whole process lasted about 10 days to two weeks. And that was just fine. Then answering machines came along. You left someone a message, and you hoped they’d get back to you either than night or the next day. Then email came along, and we began to expect a reply the same day. Now there’s texting. 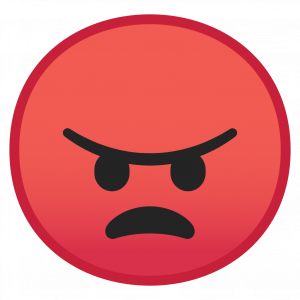 “I texted him 8 minutes ago and I still haven’t gotten a reply!” Angry Emoji! Life has sped up and I’m not sure it’s progress. Here’s a 2nd symptom of Hurry Sickness. Multi-tasking – doing more than one thing at a time. Have you seen people shaving while driving a car? Or putting on make-up while driving? I once saw a guy reading a book while driving! And we all know the dangers of driving while talking on our cell phone or reading a text, yet we sometimes do it because multi-tasking is a way of life. Think about how fast food drive-through’s work today. While they’re giving me my change they’re taking someone else’s order. Multi-tasking is built into the system! Who decided that was okay? I want to talk with that person! 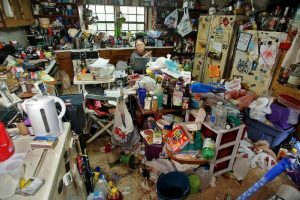 Hurry-filled lives lead to clutter. A lot of clutter. My office is often a mess because I don’t have time to file this piece of paper, so I’ll just put it here on this pile and deal with it later. And that pile keeps growing . . . . along with all the other piles. Of course we also clutter up our minds, our calendars, our schedules, our free time, our to-do lists, our junk drawers, our closets, our garages, our attics (our sermons!) . . . .
We can love when we’re active, when we’re doing things – but it’s much harder when we’re inwardly rushed, hurried, frenetic. In the same way, we can pray when we’re active but not so well when we’re hurried and rushed. That can go a long way in helping us love God and on another. This Lent we’re focusing on prayer. There’s a type of prayer that’s immensely helpful in eliminating hurry. It helps us be more connected to God and to people because we’re less hurried and harried! 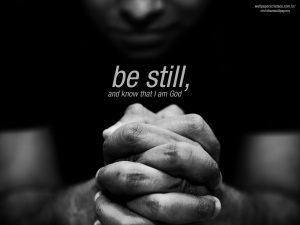 The discipline is that of meditation – being still in the presence of God. 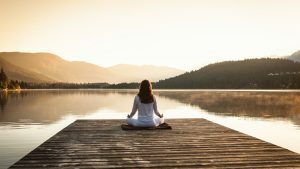 Now meditation has a long history in our faith, even though we tend to think of it as an Eastern practice – along with yoga, Zen, transcendental meditation. And that’s a sad commentary on modern Christianity, which has tended to be very doctrinal and philosophical. But Christianity in its essence is mystical and highly spiritual. It’s not just about believing in God, it’s about experiencing God. It’s not just about having all the correct doctrines about God, it’s about experiencing the companionship of God, the embrace of God, the love and power of God. And that’s were meditation comes in. 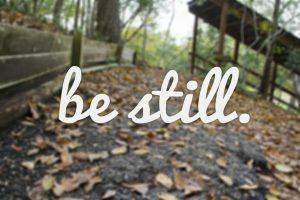 The Bible is filled with references to meditation – to being still in God’s presence, to be fully present to God. The Book of Revelation, ch. 1, John says he was “in the spirit on the Lord’s day” when he received these revelations, these words from God. John was meditating in the presence of God when God spoke. So, you can see that meditation has a long history in our faith, going all the way back to the Bible. And throughout church history, mystics, monks and people just like you and I have practiced this spiritual discipline. The goal of meditation is communing with God, oneness with God as the mystics would say. The goal of other types of mediation is sometimes detachment – detachment from the world, even detachment from one’s self. That’s a fine practice but it’s not primary goal of meditation. The goal of Christian meditation is not detachment but attachment – attachment to God. In some forms of meditation, the goal is to empty one’s self – free from worry, free from desire, free from self, free from ego. There is that in Christian meditation but still our ultimate goal is not merely emptying ourselves, but it’s emptying ourselves in order to be filled with the Holy Spirit. As John the Baptist said – “He must increases, I must decrease.” More of God, less of me. 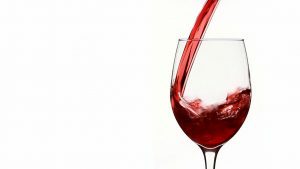 Christian meditation is like viewing your soul as a beautiful wine glass, goblet, and asking God to fill it with the new wine of the Spirit. Sometimes we may feel the goblet has to be cleaned first – and God will do that. God’s grace will make it shine like new – “If anyone is in Christ, he or she is a new creation!” But the goblet of our souls longs to be filled with God. Your words will be few, the silence great. Meditation helps us listen. It helps us “keep company” with God – personally, loving, experientially. Well, we learn to meditate by meditating. This Lent we’re not just going to talk about something and then tell you to go home and practice it on your own – I certainly hope you will. But let’s practice it here. What better place to practice our religion than in church! There are a number of different ways to meditate. There are guided meditations – we’ve done them here. 2. You can meditate on a story from the Bible – see it, put yourself in it, feel it. Ex. Prodigal Song, children in Jesus’ arms. 3. You can meditate on a specific word, such as love, grace, faith, or even the name of Jesus. 4. You can use a famous prayer – like the Lord’s prayer, saying it slowly, stopping to examine and then pray each phrase, each petition. We’re going to do two types of meditation this morning. 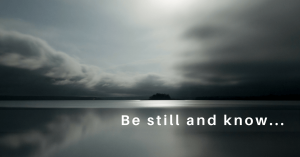 Breathing – breathing0 in the Holy Spirit and breathing out distractions. Meditating upon a verse of scripture. I’m going to suggest we meditate using a scripture, specifically Psalm 46. Say is repeatedly to yourself. Focus on each word. Chew on each word – digest each word. The goal is to personalize and internalize the passage. Now, please sit up straight, feet flat on the floor. Focus on your breathing. Breathe from deep within you. Breathe out your worries, your fears, your anxiousness, anything that gets in the way of your relationship with God. And breathe in the Holy Spirit, the presence of God. Now meditate on the scripture you chose, saying it a number of times, letting it be either the word of God to you, or your deep sincere words of faith to God. Loving God, thank you for these moments when we draw near to you and you draw near to us. Help us to see you in the quiet – without hurry, anxiety or rush – that our lives might exhibit your peach and your presence within us. In Jesus’ name. Amen. Try this week to ruthlessly eliminate hurry from your lives – through breathing, praying, listening, and loving. Will be with you all!